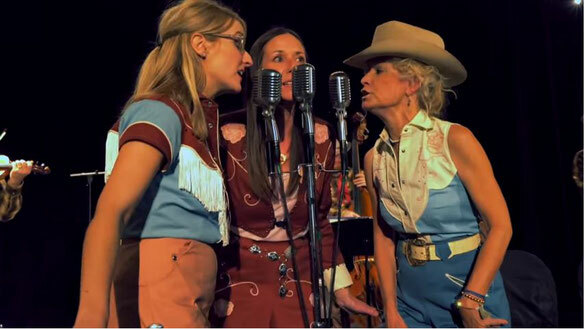 Rising up from deep musical roots in America's heartland, The Cherokee Maidens, along with their star-studded band, Sycamore Swing, pay homage to the past. The melodic braid of these three maidens is time-tested. Robin Macy has sung up and down the I-35 corridor for decades. Together with red-dirt girl Monica Taylor and bluegrass virtuoso, Lauren White, you've got signature three-part harmonies that weave their way into your heart. One was a Dixie Chick. Two have appeared on Garrison Keillor's A Prairie Home Companion. Two have sung on the Grand Ole Opry. And all three shares Native American heritage - hence their name, inspired by Cindy Walker's 1941 country hit. Backed by a troupe of crackerjack musicians, led by Kentucky White, their guitar-slinger and producer, Sycamore Swing keeps the classic genre authentic - featuring the best of the fabled Tulsa Playboys. Their latest recording, My Dixie Darling, is all about bloodlines - the prodigious Eicher and White families come together with a shared passion for the past. This third time around, country swing legend Ray Benson of Asleep at the Wheel also croons a tune. Don’t be pokey you can be an Okie too. Sooner or later you’ll be an Okie too.